Life's Little Occasions Sticker Medley - K&COMPANY-Life's Little Occasions Collection: Sticker Medley. It's a mix of our best-loved embellishments all in one perfect pack! Mix and match colors and textures from an array of chipboard stickers, dimensional stickers and dome stickers. 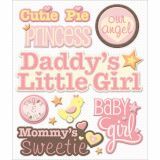 This 4-1/2x6 inch package contains twelve stickers. Design: Baby Girl Names. Imported.